The lean movement is revolutionizing how companies create products – it focuses on customer development, tackling the risky parts first, and then finds real, unmet needs. At the core of this is iteration—a cycle of learning and adapting that’s driven by data. 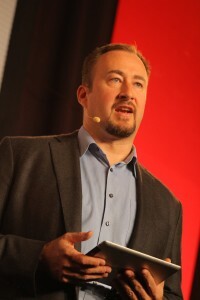 Alistair Croll is an entrepreneur, author, and event organizer. He spends a lot of time understanding how organizations of all sizes can use data to make better decisions, and on startup acceleration. He’s worked in tech most of his life as a product manager and has been directly involved in the launch of five major conferences: O'Reilly's Strata; Techweb's Cloud Connect; Interop's Enterprise Cloud Summit; the International Startup Festival; and GigaOm's Structure. He’s spoken at a variety of other conferences, including Le Web, Web2Expo, IGT, Velocity, Lean UX, Enterprise 2.0, Mesh, and eMetrics.